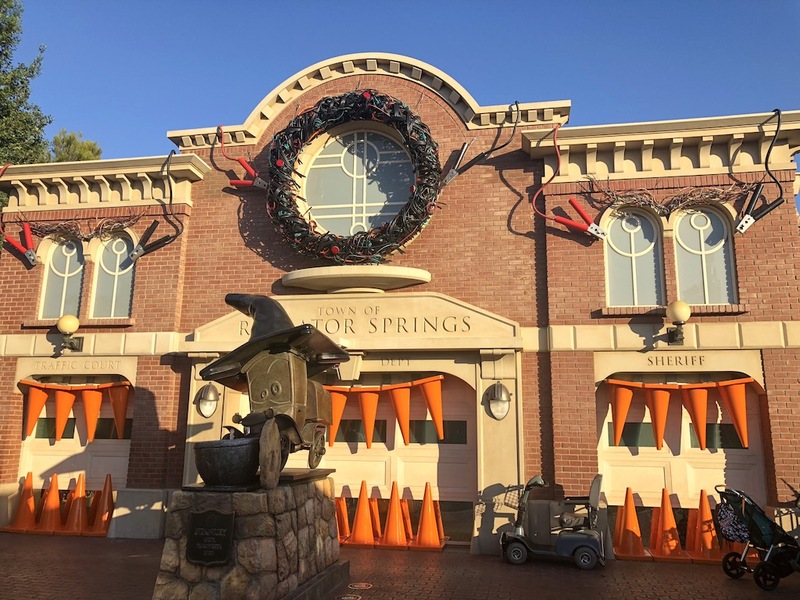 Radiator Springs has been transformed (with the help of its citizens) to Radiator Screams! 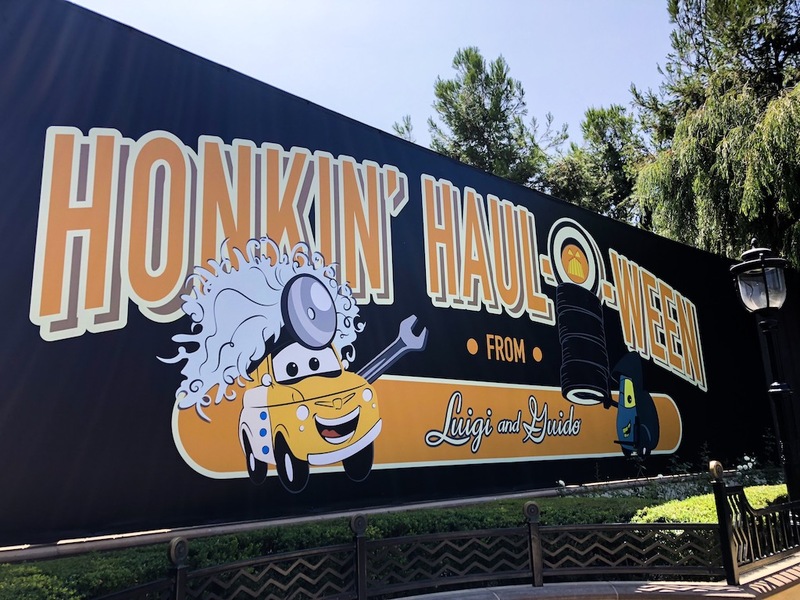 Step inside the town and celebrate Haul-O-Ween with Lightning McQueen, Mater, Red, and DJ as they dress up in their “car-stumes” and trunk or treat. Take your time and look around this little town and all the details that were put into it. 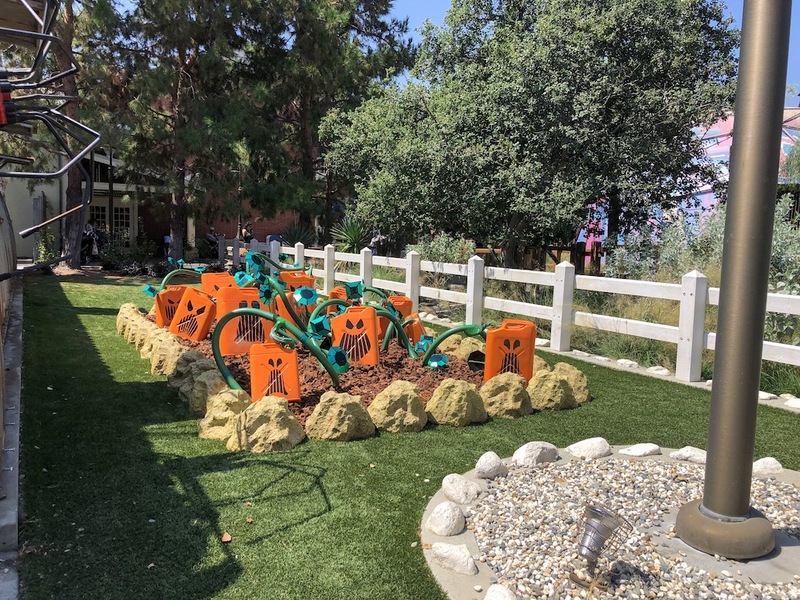 Chains as cobwebs, parts of cars as spiders, and gas cans as jack-o-lanterns are some of the little touches that can be seen throughout. Stop by Ramone’s House of Body Art as he celebrates Día de los Muertos and dedicates an ofrenda for the late Doc Hudson. 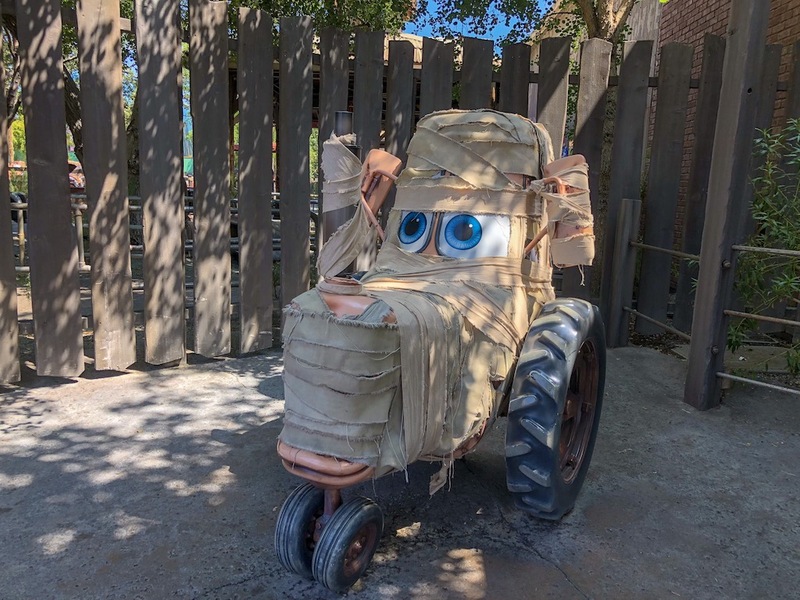 As you walk around enjoying all the decorations, don’t forget to check out two Cars Land rides that have gone through a spooky transformation: Mater’s Graveyard JamBOOree and Luigi’s Honkin’ Haul-O-Ween. 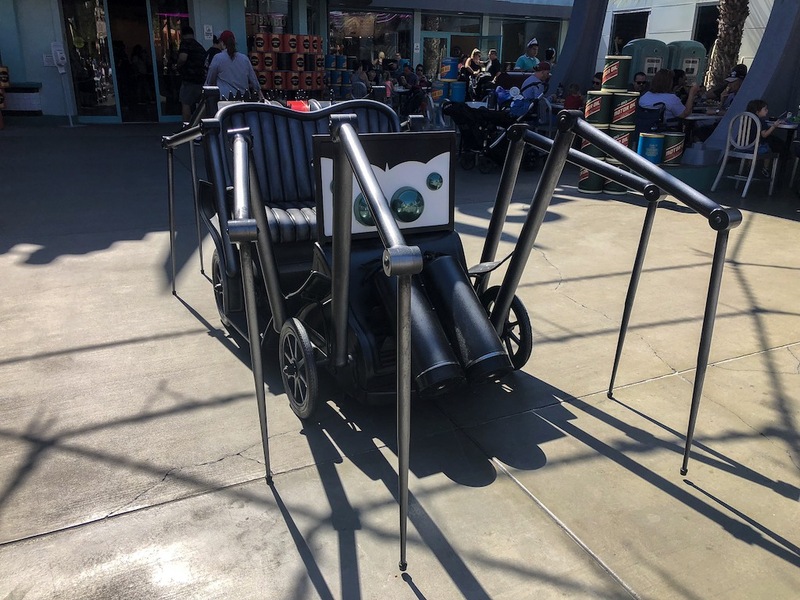 Not only did the decorations change for both of the rides, the soundtracks did too! 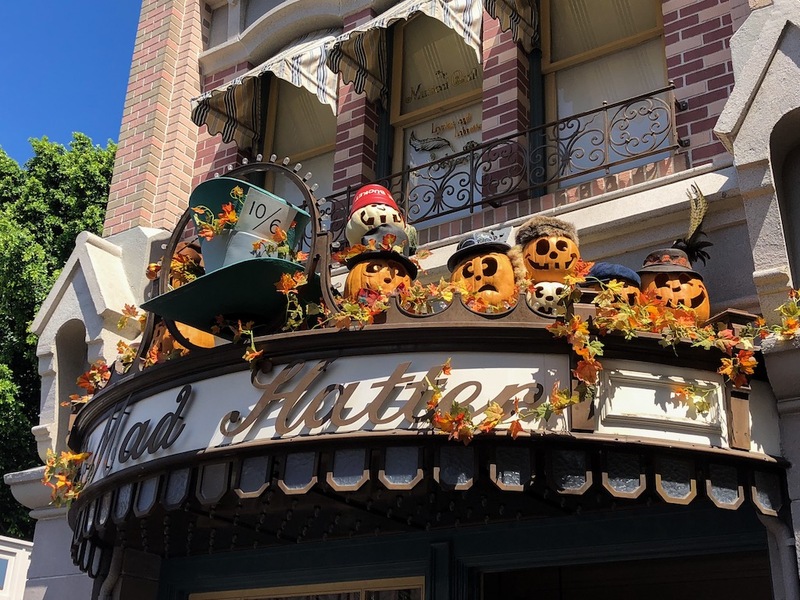 With fall and Halloween just around the corner, Disneyland Resort has put a lot of time and effort in changing up the seasonal treats and savory eats around the resort for guests to enjoy. If you are planning on eating the spellbinding eats, make sure to pick up a handy food guide that is available around the parks. 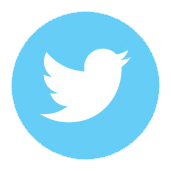 It will help you organize all the tantalizing temptations that the two parks have to offer. 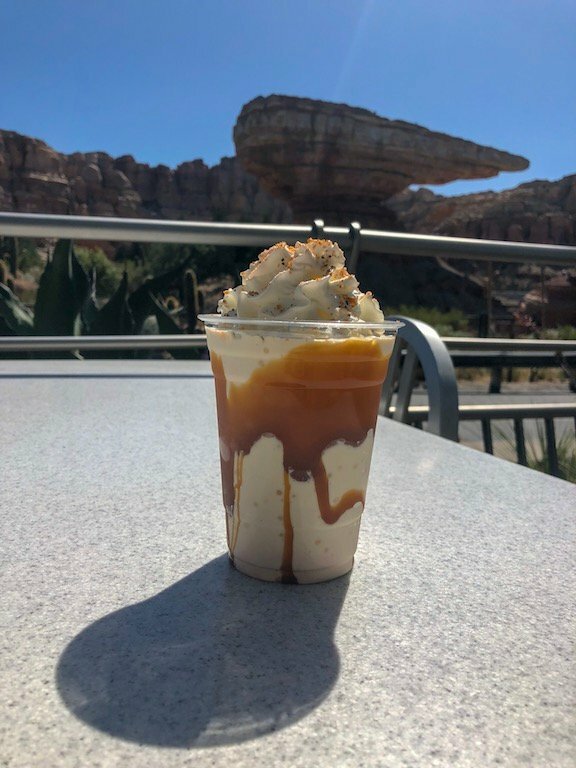 If you’re a pumpkin spice lover, try the Pumpkin Pie Shake over at Flo’s V8 Cafe. For those daring spice lovers there is the Fire Dragon Tacos over at Studio Catering Company. Tender pork belly in a soft corn tortilla topped with kimchi slaw, Korean BBQ sauce and Sriracha crema will have you wanting to come back for more. The heat is not going to get you at first, but there will be a slow spice creeping up on you which will linger even after you finish. 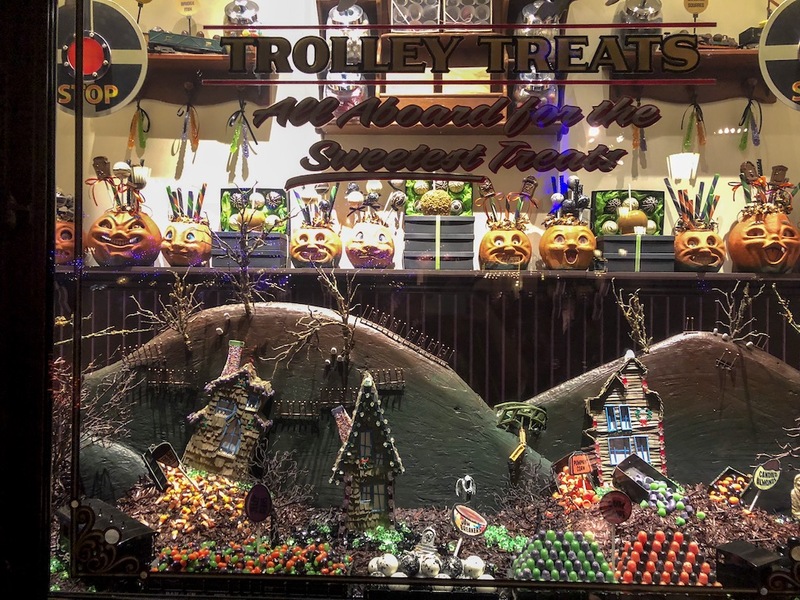 Not only will the food guide show you where the food is, it will also list all the great Halloween souvenir novelties that are available, like the Cauldron Popcorn Bucket or the Headless Horseman Light-up Straw. 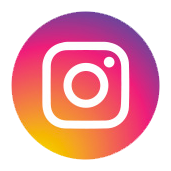 Get your cameras ready — there are a lot of picture perfect photo opportunities all over the park! 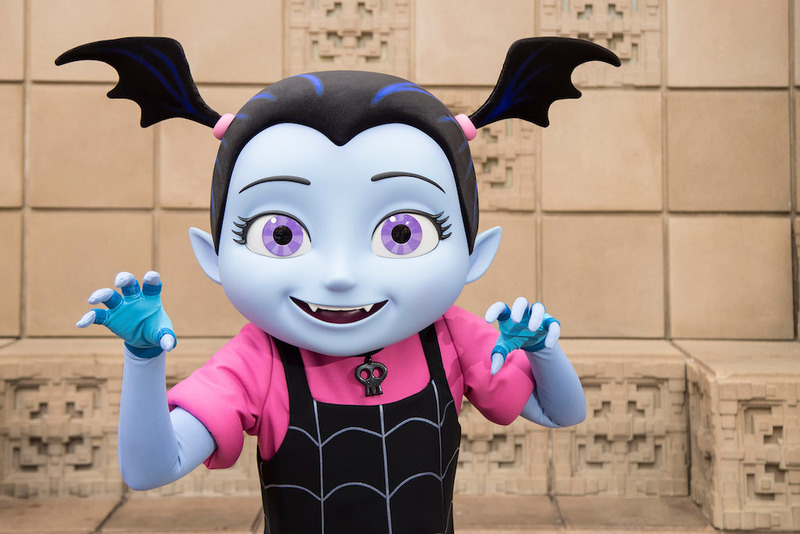 Not only will the “Fab Five” be wandering around in their Halloween costumes but Vampirina, the popular Disney Junior star, will be in the Disney California Adventure Park in front of Disney Junior Dance Party ready to greet guests for the very first time! 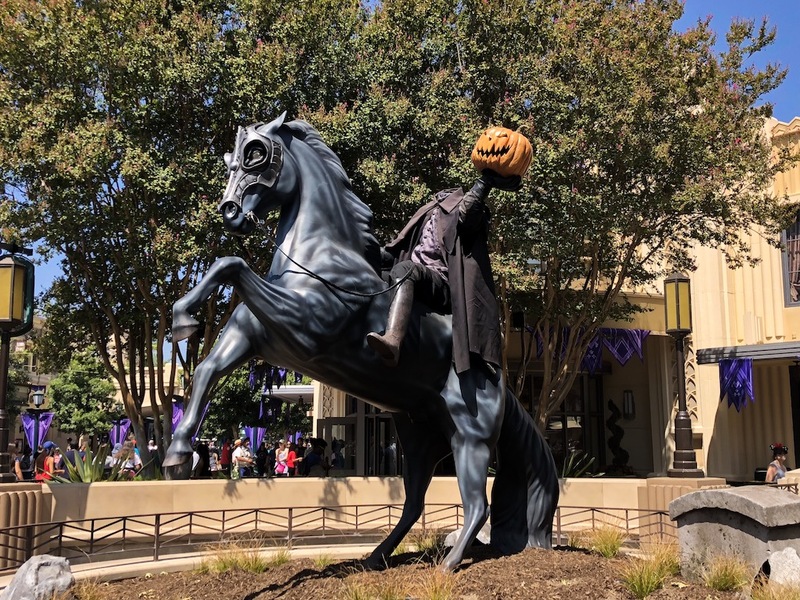 Don’t forget to snap a photo with the Headless Horseman statue inside Disney California Adventure. 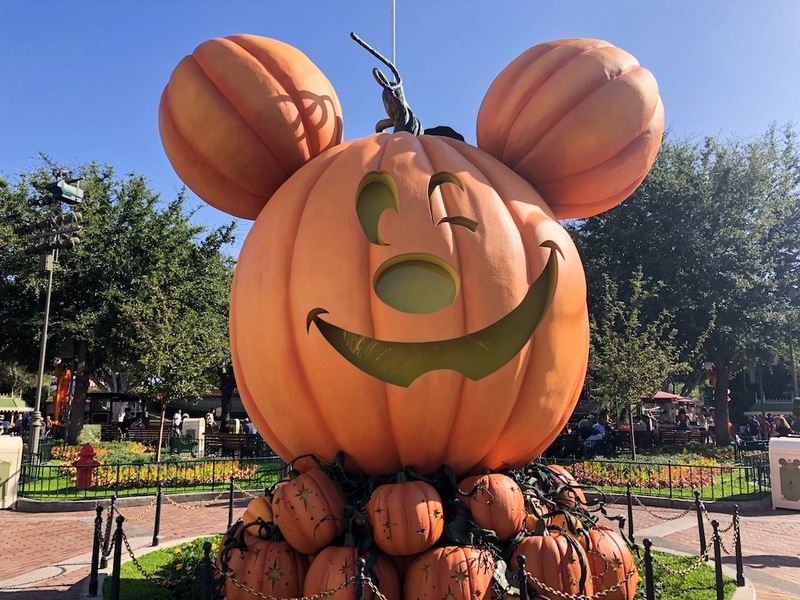 If you are in the Disneyland Park, take a photo in front of the Mickey Mouse jack-o-lantern on Main Street, U.S.A. — don’t forget, there are two sides! If you are heading to grab some delicious Pumpkin Spice Beignets over at the Mint Julep Bar in New Orleans Square, why not visit and share your beignets with Jack Skellington and Sally over by the Haunted Mansion! 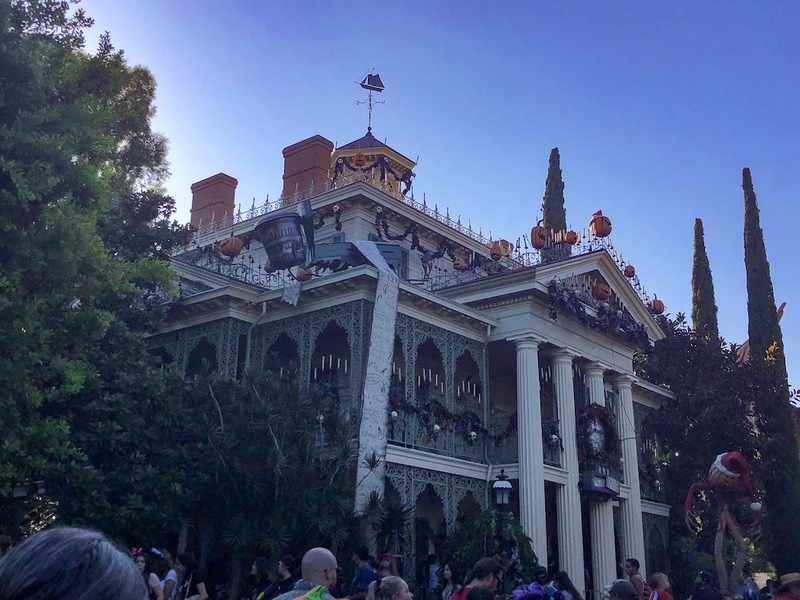 After snapping a photo with Jack and Sally, head into one of Tim Burton’s classic movies, The Nightmare Before Christmas, as the Haunted Mansion is transformed for the 18th time into the Haunted Mansion Holiday. 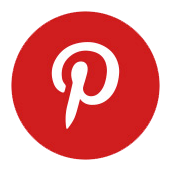 Come visit Jack as he dresses up as “Sandy Claws” and delivers ghoulish delights from Halloween Town to all the 999 happy haunts who dwell in the Haunted Mansion. 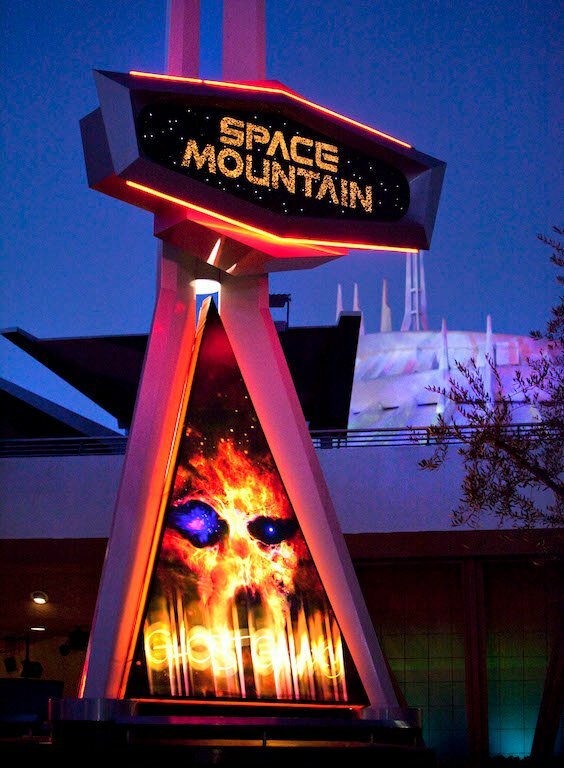 Also in the Disneyland Park, Space Mountain has been taken over by an intergalactic ghost as spooky sounds and spirits encircle your rocket ship! 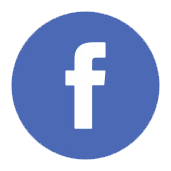 Space Mountain Ghost Galaxy can have a long wait time, so if you are planning on riding this attraction, think about getting Disney MaxPass to get a FastPass. 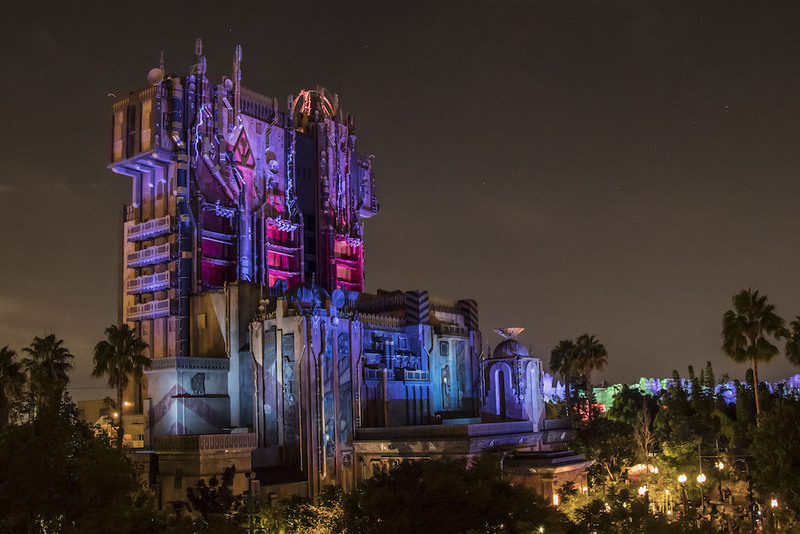 Last, and certainly not least, return to the Collector’s Fortress after 5 pm and experience Guardians of the Galaxy – Monsters After Dark, the sequel to Guardians of the Galaxy- Mission: BREAKOUT!. Like Space Mountain Ghost Galaxy, this ride queue can get very lengthy; try to get a FastPass for the ride with a return time after 5 pm. Take a break and grab one of the delicious churros being offered in Disneyland and take a stroll and admire all the halloween decorations! 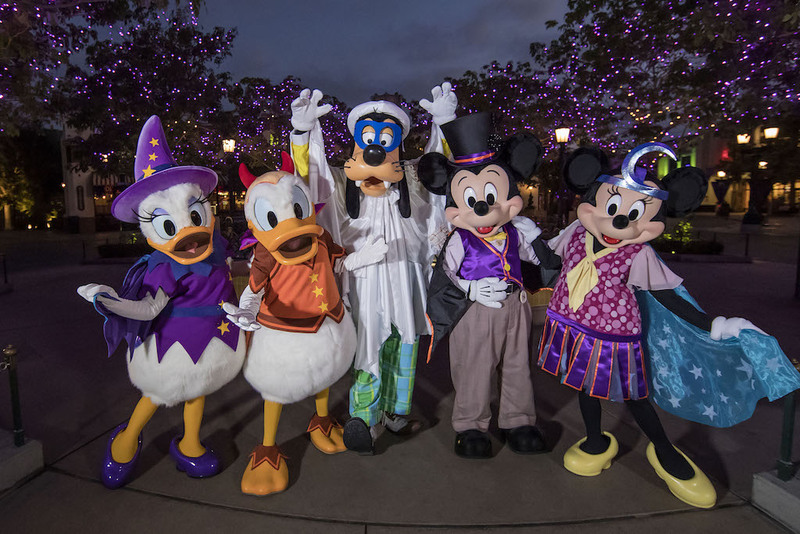 All through Main Street, U.S.A., festive decor from banners to playful jack-o-lanterns can be spotted throughout the streets. 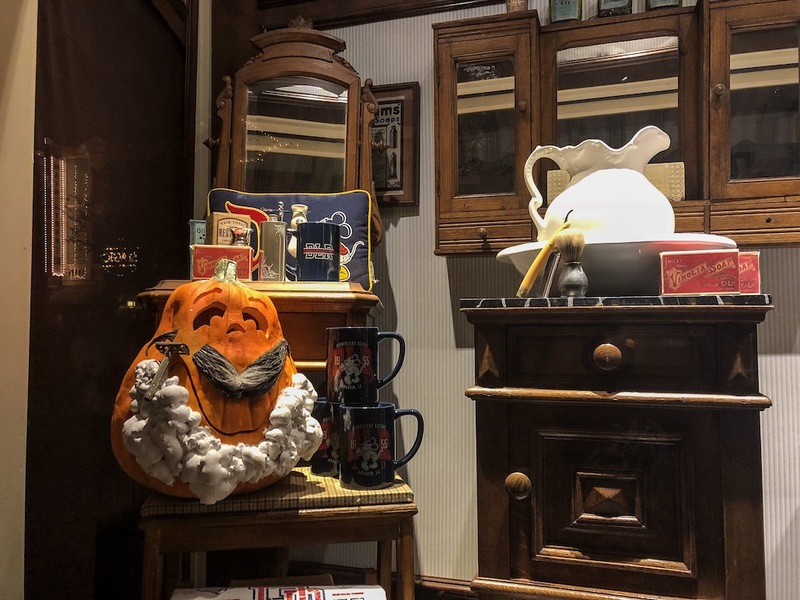 Each shop is beautifully decorated with playful Halloween theming that ties in with what the shop is, like pumpkins on top of the Mad Hatter Shop that all have diverse hats or the beautifully decorated tea table by Gibson Girl Ice Cream Parlor. The decorations over at Disneyland are best seen in the the daylight. 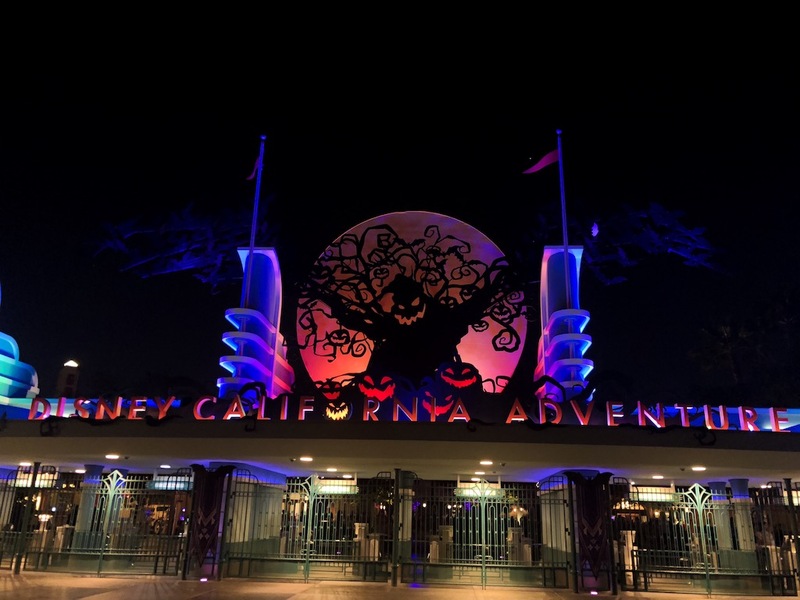 For nighttime decorations, head to Disney California Adventure. Oogie Boogie takes over the park at dusk and changes the music to more eerie Halloween appropriate music. Buena Vista Street windows are decorated and can easily be seen at night. 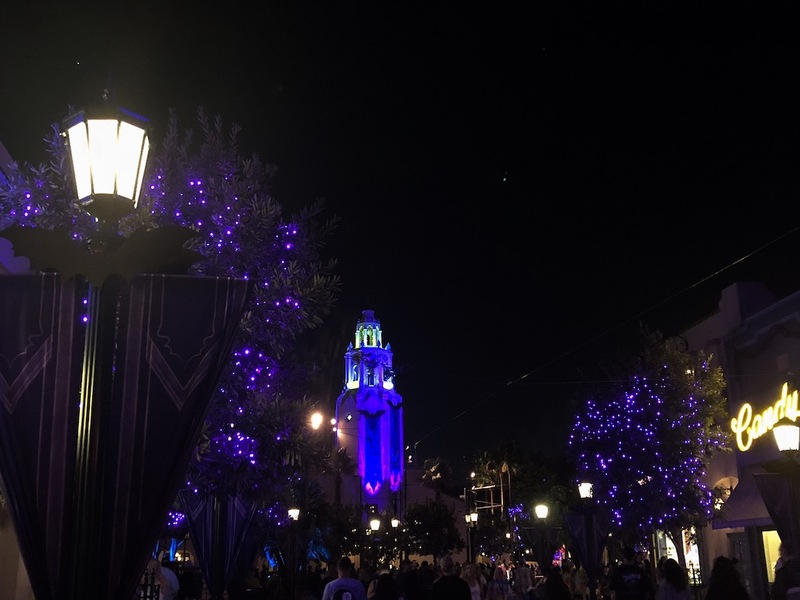 Beautiful twinkling purple lights decorate each tree surrounding the rotunda near Carthay Circle Restaurant which light up the dark night sky. 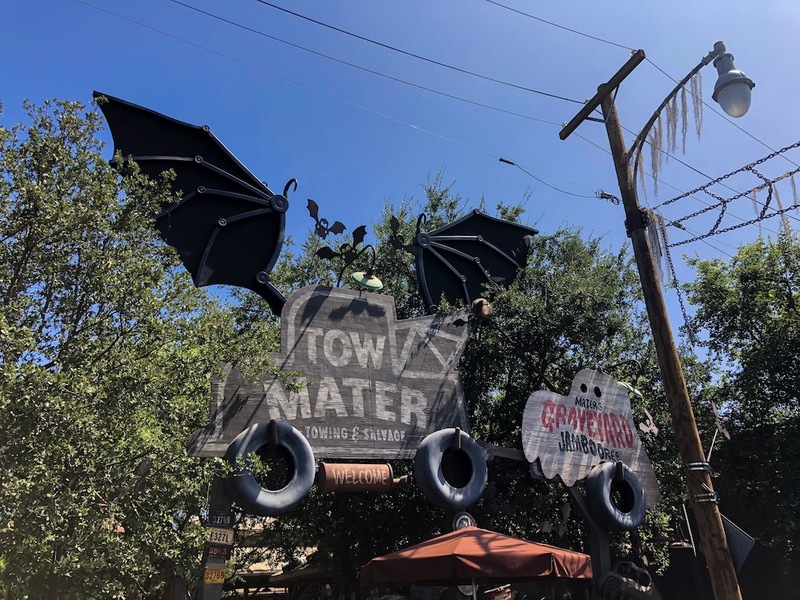 The bats on the light posts come alive, with red eyes blinking as you walk by. 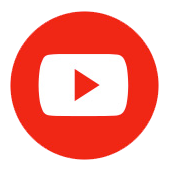 If you dare, spend a few moments by the Headless Horseman statue and wait until the lightning strikes, you may see him come alive along with his horse.